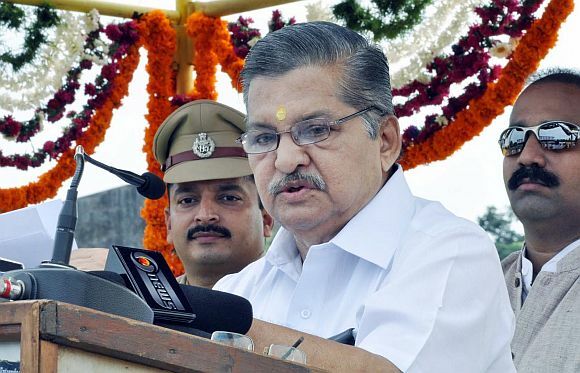 Justice M F Saldanha, former judge in the Bombay and Karnataka high courts, kicked a storm when he stated that attacks on churches in Karnataka should be treated as terrorist strikes. 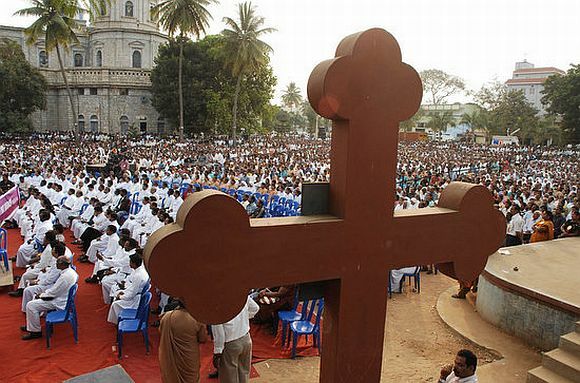 The Karnataka government claims that the situation is under control, but the fact remains that three more churches were attacked only last month. 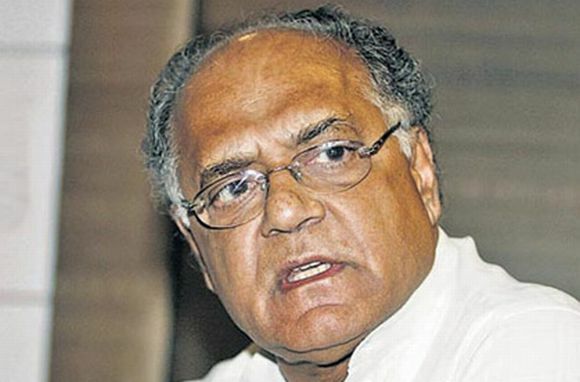 Justice Saldanha, who had prepared a detailed paper on the church attacks in the state recently, says in this interview with rediff.com's Vicky Nanjappa that if religious fanaticism in Afghanistan was being treated as an act of terror, then he does not see any reason why attacks on churches should not come under the same purview. 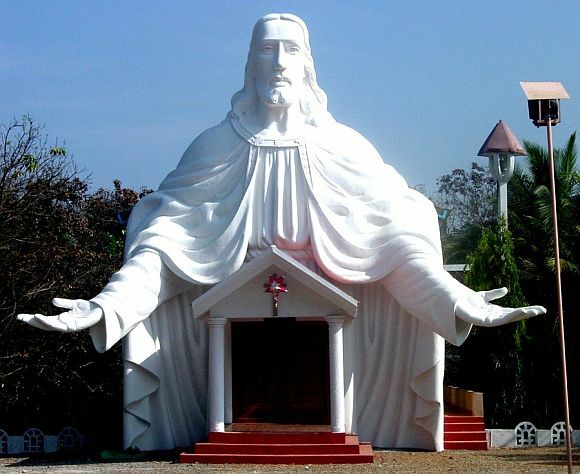 Have the attacks on churches in Karnataka stopped? Absolutely not! It continues to be a threat. 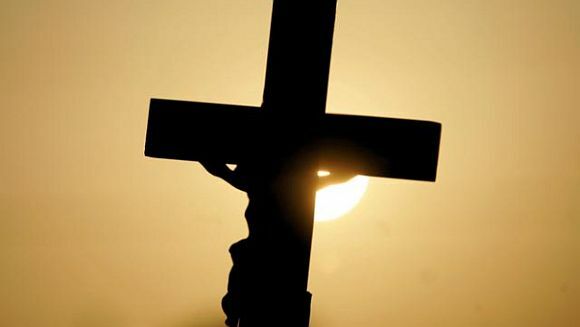 Even last month, three churches in the Mangalore belt were attacked by miscreants. How do you think the state government (pre and post Yeddyurappa) is dealing with the issue? I really would not blame B S Yeddyurappa (former chief minister) for the entire episode. It was his then home minister, Dr V S Acharya who is to be blamed. Acharya, being a pracharak (teacher) was answerable to the Rashtriya Swayamsevak Sangh and this is what led to the situation turning worse in these areas. All that Yeddyurappa did was support Acharya. Could you explain your controversial statement about equating the church attacks to terrorism? These are not just incidents of communal violence. These are ways of terrorising a community and hence it should be treated as terrorism. Look at the manner in which the fanatics in Afghanistan behave. Has that not been treated as terrorism? The same rule of law ought to be applied here as well. 'Do you think the Christians will not fight back? Although repealed, are you trying to say that acts such as POTA or a TADA should be applied in such cases? There are enough laws on hand to deal with terrorism. I feel the similar laws should be applied here as well. All I am saying is these cases should not be treated as cases of communal disharmony. The culprits tend to get away easily and the punishment should be such that it should act as a deterrent for further incidents. 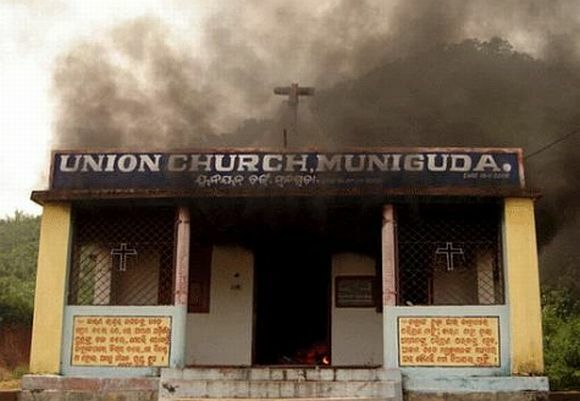 Is there a change in the manner the Christians in Karnataka feel today after all these incidents? That is my biggest worry. Do you really think the Christians will not fight back if they are terrorised this way every now and then? What do we gain at the end of it? Reaction and counter reaction. It will be absolute chaos; this is very bad in the larger interest of the state. Safety of a community being threatened is secondary, but the repercussions are what we must worry about. Has the Christian community started looking to the international community for help? No they have not. Discussing the issue abroad does not mean they are looking for help. If the state government fails then they always have the Union government to look up to. Questions have been raised about your discussions of this issue with the international community. I was not in the UK and France to discuss this matter. I was there to deliver a lecture. If the people there come and express their concern, it is not my fault. The report I have prepared is treated as authentic text and this is what people want to know about. What does the international community really think of the church attacks? They are obviously concerned and treat some areas as unsafe. The states, which come to their mind, are Gujarat, Karnataka and Orissa. Do you also feel that these three states are the worst hit where safety of Christians is concerned? As of today, the problem is only in Karnataka. The other states have taken stock of the situation and such attacks have stopped. I have been told that Gujarat Chief Minister Narendra Modi has been doing an excellent job where the development of his state is concerned. Why should a prosperous state be known for negative incidents? Karnataka should also bear this in mind. Is it right on the part of the international community to sit in judgment about the issues in India? They have expressed concern. Even we do express concern if there is violation of human rights in other nations. The fact is that the eyes of the world are on us and we cannot afford to set a bad precedent. Countries have been issuing advisories while travelling to India. If we portray that we are an intolerant state then such advisories would only increase and in the long run we would only lose in terms of revenue. Do we need this? Are you hopeful that the recommendations in your report will be acted upon? Let us hope. But it has created awareness. Debate! Should Communal Violence Bill be altered?